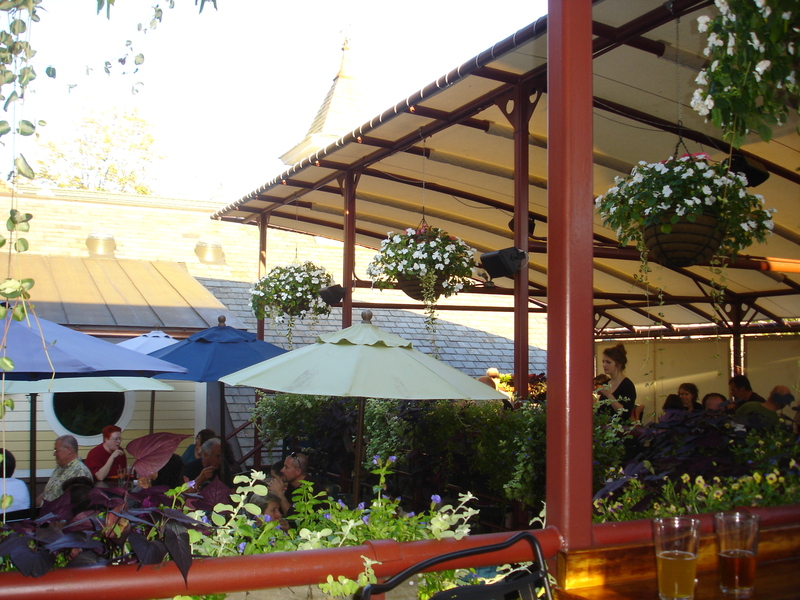 The deck bar at Northampton Brewery, Northampton, Mass. Northampton, Mass. is one of those college towns that either make you feel optimistic or pessimistic, depending on your political leanings. Of course, I wasn’t there for the neo-hippie culture or politics. I was there for beer. Northampton Brewery calls itself the oldest operating brewpub in the Northeast, and its history spans from August 1987. It’s a spacious brew pub with a nice variety of beer styles, most of which during my visit trended toward the hoppy. The main room, with its three-sided bar, has an inviting, ski-chalet sort of feel to it. The ceilings are high and natural and artificial light pours in from many different angles. There are a few high tables around, along with a couch for television watching. There’s another floor above, and a larger dining room that’s joined by a small hallway. As luck would have it, I arrived on the last weekend that the outdoor dining was available. The wait was 35 minutes for an outdoor table, which was fine, as it was a beautiful, warm evening. Nursing an Octoberfest, I was able to take in the well-dressed crowd and the orange leaves on trees to the north. The last days of summer, from Northampton Brewery’s deck. The lager was perfect for a warm-up: neither too bold nor watery. Its malt came through fine, and was nearly balanced by a gentle bitterness. Standing on the deck made me feel like I was at beach resort, what with all the tanned and moneyed guests mingling about. A dude who looked like he could be in a Viagra commercial sported a Martha’s Vineyard baseball cap. Busy waitresses and bar backs, wearing black and lots of colorful tattoos, moved among us with snakelike grace, despite the trays of full pints and salads. I treated myself to another beer while waiting for my table: the Blue Boots India pale ale. This had the distinctive aroma of Citra hops, which some might disqualify as over-the-top or even funky. I thought it leant the perfect accompaniment to this stolen moment of summer. It also paired well with the peppercorn salmon I ordered when I did get seated, matching the salmon’s potency and amplifying its muskiness. To finish off, I tried the brewery’s porter, which they had on cask. Creamy, with coffee tones, it was a bit chalky but a treat after the comparably abrasive IPA. As I bade adieu to the bartender, who was proudly wearing the brewery’s motto of “peace, love and beer” on her shirt, I decided that I would feel optimistic about the soon-to-be college graduates that lined the streets. They may be launching into an uncertain world, but they’re at least appreciating much better beer while they do it. 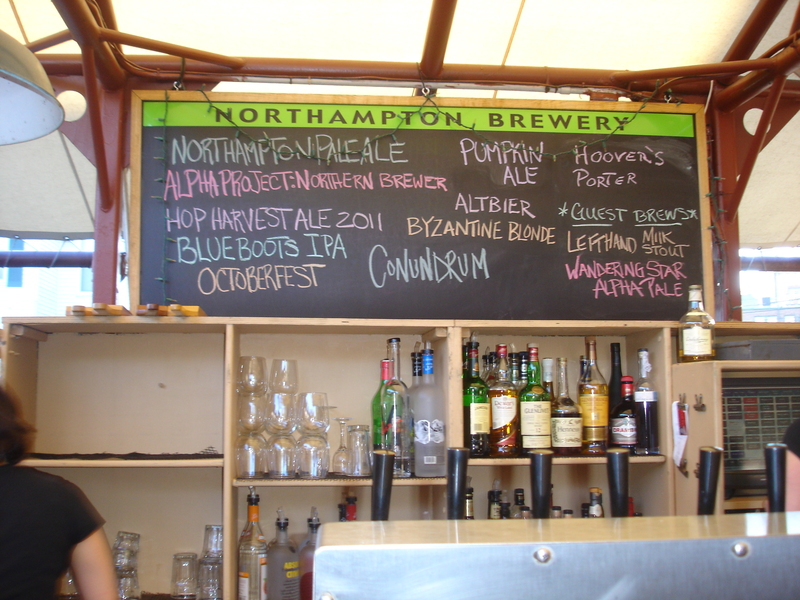 This entry was posted in Beer Snob and tagged Brewery, Northampton Brewery. Bookmark the permalink.